Come learn about The Principles of Our World. In a series of real-life stories, readers will be introduced to The Principle of Honesty. 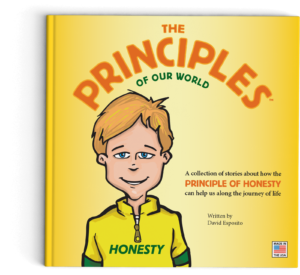 The stories in this children’s book are meant to remind all of us about the importance of honesty in our lives. Enjoy the book in one sitting or read just one story at a time. “Hello, I am The Principle of Honesty. “People say that I am the reminder they need to remain truthful in all that they say and do. “There will be times in your life when you may feel it is difficult to be honest and tell the truth. You may be afraid of getting into trouble, or you may be worried about what others may think of you when you tell the truth. “My parents told me that honesty is the best policy, and that is why they named me Honesty. “Please call on me when you need the strength to be Honest. I can help remind you about how important it is to tell the truth.